Click on a link below for more detailed information about each topic. 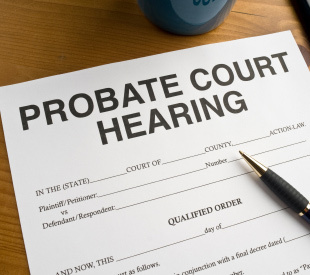 PROBATE is the administration of a person's estate that is overseen by the Clerk of Superior Court in the county in which the decedent lived at the time of his/her death (not necessarily the county in which the decedent died). All property passing to beneficiaries by WILL or by intestacy (when a person dies without a valid WILL) is subject to the PROBATE process. A PROBATE proceeding begins when a PERSONAL REPRESENTATIVE (referred to as an EXECUTOR when the decedent has a WILL and referred to as an ADMINISTRATOR when there is no WILL) files the decedent's WILL, or files paperwork declaring that the decedent had no WILL, and various other administrative documents with the Clerk of Superior Court. The PERSONAL REPRESENTATIVE must be "qualified" by the Clerk of Superior Court in order to act on behalf of the estate and receives Letters Testamentary (or Letters of Administration in the case of an intestate estate). The Letters Testamentary evidence the PERSONAL REPRESENTATIVE's authority to act on behalf of the estate. The PERSONAL REPRESENTATIVE (EXECUTOR or ADMINISTRATOR) is responsible for settling the decedent's estate. This is done by gathering the decedent's assets, paying the decedent's debts (including taxes) and paying out the remaining assets to the decedent's beneficiaries, whether the beneficiaries are determined by WILL or by the intestacy laws. PROBATE fees: Not all property is subject to probate fees, including real property and NON-PROBATE property (i.e., Retirement benefits and life insurance proceeds payable to named beneficiaries). The total fee is 40¢ for every $100 of property subject to probate fees, with a cap of $6,000. For example, an estate with $100,000 of property subject to probate fees would owe $400 in fees. The PROBATE process can take several months or even years to complete. The process ends when the PERSONAL REPRESENTATIVE files the appropriate forms with the Clerk of Superior Court showing that the estate's debts have been satisfied and that the remainder of the estate has been disbursed to the appropriate beneficiaries (this last filing is referred to as the Final Account). The PERSONAL REPRESENTATIVE will be discharged by the Clerk of Superior Court when the Final Account is approved. Not all property is subject to the PROBATE process. property transferred to aTRUST prior to death.